Date : Thursday 13th October 2005. 3.40 pm start. Location : Barrow Fell, overlooking Derwent Water, in Cumbria UK. Occasion : An afternoon walk with Ann and the Dogs. Walk details : 2.5 miles, 1200 ft of ascent plus a rapid tea afterwards before we went out. 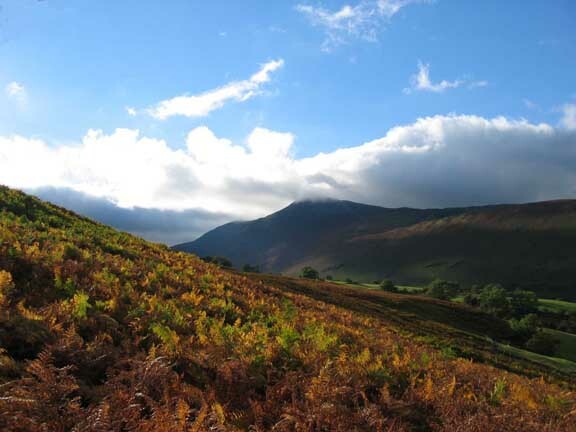 Weather : A fine and warm afternoon, but the high cloud on the fells hid the last of the sun. Driving down Newlands Valley the afternoon sun was really emphasising the early autumn colours, so we just had to stop for this photo. 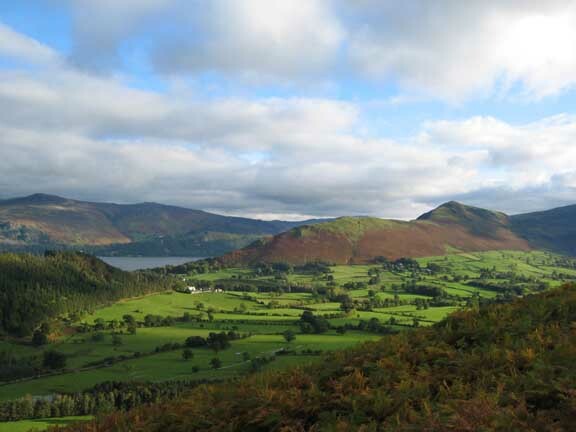 The characteristic shape of Catbells on the left and Maiden Moor to the right. Conditions were similar for Skiddaw as we parked the car and began our walk. 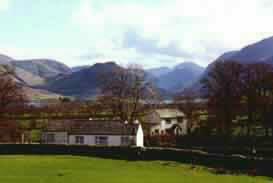 This is the village of Braithwaite with Skiddaw behind. The true summit is actually hidden behind that cloud. Was this a case of Skiddaw Little Man trying to claim the higher summit while it had the chance ?. Grisedale Pike from the ascent of Barrow. Cloud to the west couldn't hide the blue sky and the sunshine. 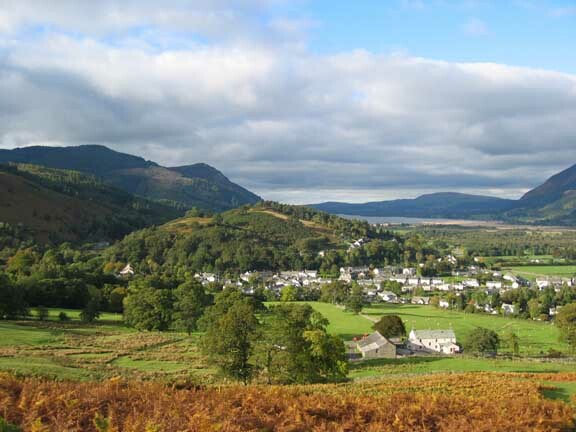 Braithwaite How and the village from the ascent of Barrow. Our route crossed the central field and round the farm buildings before striking upward. 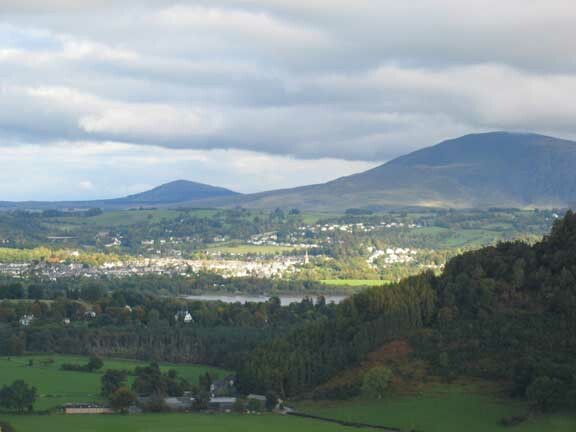 Keswick and Derwent Water with Great Mell Fell in the background. Sunshine shines on the righteous, but I wasn't there as I had the day off ! Catbells and Newlands Valley in the late afternoon light..
Bleaberry Fell is the high ground beyond the lake. 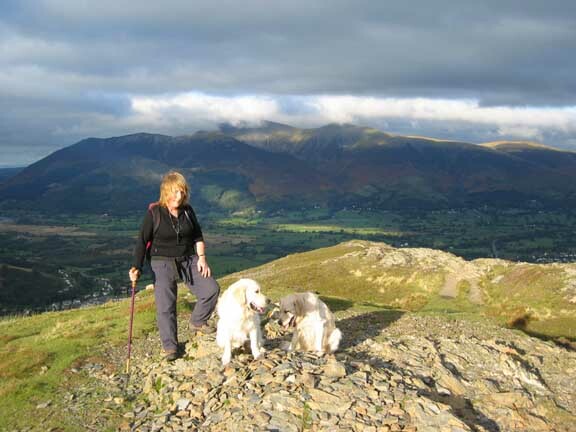 Ann and the dogs reach the summit of Barrow. The afternoon sun would soon end as it dipped behind the cloud in the west. Our return was by the same route but with the views ahead of us as we descended. This was the end of a relatively short walk as we had an evening appointment to get to. 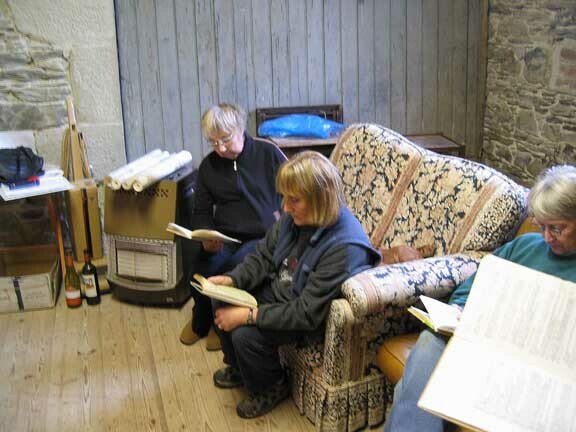 . .
a rehearsal for the Loweswater Village Play . . .
Ann following the script and waiting for her grand entrance ! She has volunteered for a part in the Tethera Valley Players Annual Thespian Adventure. For my part, I have been promoted to the role of Stage Manager - no one else wanted it ! It befalls me to organise, build and decorate the stage set, but life is made a little easier because we have access to a local warm(?) 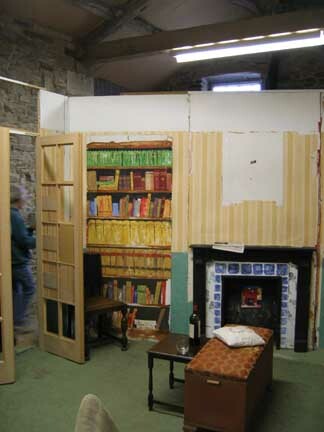 and dry barn where we can build it and the cast can rehearse "on stage". 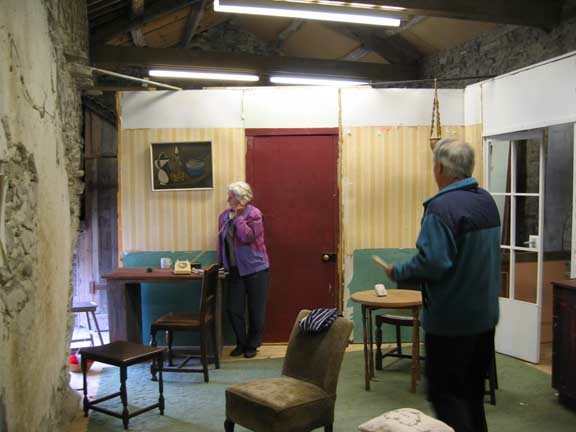 This years play is a "Breath of Spring" - a minor West End comedy, to be performed the 17th 18th and 19th November at the Loweswater Village Hall. Buy your tickets on line here !!! "A great night out" - Loweswater Link. "Lucky if it ready on time" - Loweswater Sceptic. This site best viewed . . . with a copy of the script.